Pros The controller adds a feeling of excitement that has previously been missing from iOS releases. • Great replayability. Cons iOS release lacks some of the features of the console versions. • Same controller cannot be used with console versions of the game. Let’s get this out of the way first – I love music games but have absolutely no legitimate skill when it comes to any kind of musical talent. I couldn’t tell you a G chord from a Free Throw. Is that even a music comparison? I don’t know! That said, this is the first music game that gave me a truly immersive experience that made me feel like I was doing something akin to playing guitar. I’ve been playing plastic instrument games since I purchased the original Guitar Hero by Harmonix back in 2005, and before that I was addicted to games like Dance Dance Revolution, Beatmania, Frequency and Amplitude. As the years went on, I became more interested in the full band and varied music experience Rock Band had to offer, but after a couple of years without any new music games of note (pun intended) Rock Band 4 and Guitar Hero Live were announced. I pretty much shrugged off Guitar Hero Live until I got a chance to hold the new guitar in my hands. Previous generations of music games have largely been the same, 5-buttons and a strum bar and a mostly useless whammy bar. Until now they have been more than adequate, helping fuel our rocking out fantasies to bands like Heart, Electric Six and Flight Of The Conchords. The most exciting thing about the controller is that it gave me a feeling I haven’t had in nearly a decade; the excitement of failure! I was failing at the moderate difficulties the game threw at me and had to re-learn how to play the game at a lower difficulty level. After a month of playing it, I am still finding myself challenged and have to adjust my difficulty based on what song I am playing. This is a huge positive since it is providing a completely different experience than I was used to. The most important thing is it is fun, with a natural learning curve rather than songs just being difficult for difficulty’s sake. Be warned, you will feel like a Canadian action hero without his trusty hockey hair and denim jacket the first hour or two you spend with the game. Again, for me this was refreshing, those easily frustrated may not be as thrilled. 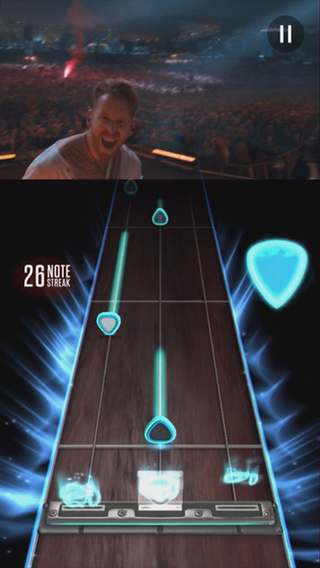 After we get past the controller, Guitar Hero Live decided to take a new direction in presentation that I am sure most of you have read about. 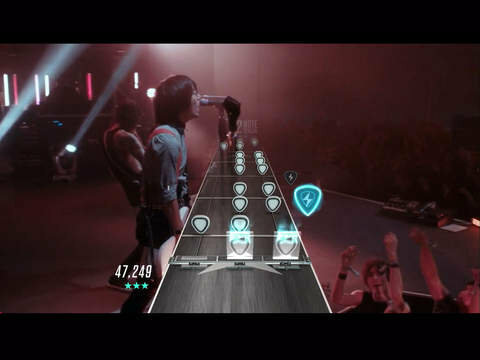 Rather than having custom bands in the single-player modes, you play in First-person perspective in front of live-action crowds and bandmates. The game even subtly shifts between positive and negative reactions based on your performance. There are 42 songs available in this mode and once played in the pre-built playlists, you can play them all at your own leisure. The real meat of the game exists within GHTV, where there are literally hundreds of songs available (over 200 at launch, and at least another 40 or so have been added since then) in two MTV2-like “TV channels” that are playing various selections of the other songs available. The replayability skyrockets here with live multiplayer showing your rank vs 9 others on the same song, and regularly added songs to the channels. Just jump on and play with others mid-song. It works perfectly and is extremely addicting. This is also where the game takes a turn from its console brethren. Up until this point Guitar Hero Live has been indistinguishable from the PS4/Xbox One version, even the controllers are absolutely identical, and that is a huge feat that I didn’t think would happen. GHTV however, is severely missing features for unknown reasons. Let me be clear before I go on, I rated Guitar Hero Live” target=”_blank”>Guitar Hero Live a 5/5 based exclusively what is offered on the IOS version, as if the console version doesn’t exist since I don’t foresee many people double dipping on a $100 game so most people won’t know what they are missing and I feel will be very satisfied with what their preferred version offers. Before receiving the iOS game, I spent quite time with the PS4 version and absolutely loved the features that are present in GHTV mode that I was sorely disappointed to not find them in the iOS version, going so far in that I delayed (ok Procrastinated…) finishing my review by a couple weeks in hopes they would patch in the missing features. 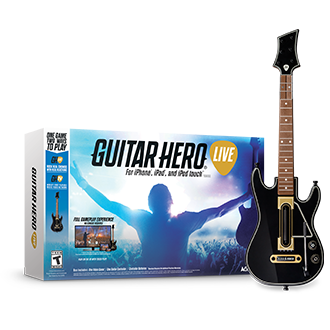 When playing on the console version, you can level up and unlock new in-game abilities, customize your note highway and player card, as well as earn or purchase “Play Tokens” allowing you to play any song in the huge Guitar Hero TV library at will without purchasing a Party Pass. These addictive features combined gave me an impetus to play “just a few more songs” and helped me gauge how well I was doing. All of these things are nonexistent on iOS, and the “Party Pass” option is currently unavailable, so you can’t even look at the full list of GHTV songs. Normally for iOS the Party pass is 99¢ for 30 minutes of unlimited play or $4.99 for 24 hours. Ideally this is designed for having people over and just playing whatever you want, but again, for unknown reasons it is disabled at the time of this writing. So far, there has been no word from Activision on if additional features will be added to the iOS version to match it with the console game. So essentially you are getting an identical gameplay experience with Guitar Hero Live iOS, but without the extra bells and whistles you won’t even miss if you only play the iOS game. The game is also supposed to work with Apple TV but I haven’t had a chance to test that as I haven’t purchased the device yet, but if the quality of Guitar Hero Live is any indication, games will finally be a good reason to do so. Finally, there is one last feature I wanted to “touch” on briefly is the option to play without a guitar. You can play a 4-button touch-only version of the game anytime you just need to scratch that music game itch. It works well, and you can see the devs put some time in to make the songs fun to play even via touch, but this probably isn’t what you spent $100 to do. I found it to be more fun on iPhone than iPad myself, and it reminds me more than a bit of Tap Tap Revenge, a much-loved early iOS game. So if are firmly entrenched in the Apple ecosystem and don’t plan on getting a video game console anytime soon, this is the game to get. There even is a “basic” mode where you only use the strum bar to play the music and I’ve discovered younger kids LOVE it. They can rock out and have a blast like the grownups do. Just a note: The controller, while identical in appearance to the Xbox One/PS4 controllers is not at all compatible with the console version of the game, and vice versa, so don’t plan on buying it for a secondary controller with the bonus of playing it on your device. A review copy of the game + controller combo was provided by the publisher for review purposes.